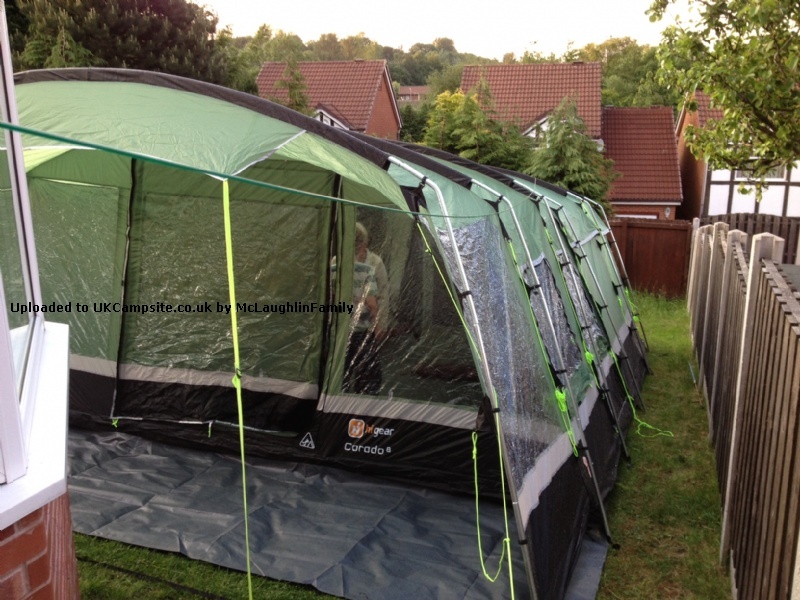 We purchased this tent second hand after deciding to get back into camping with kids in tow. 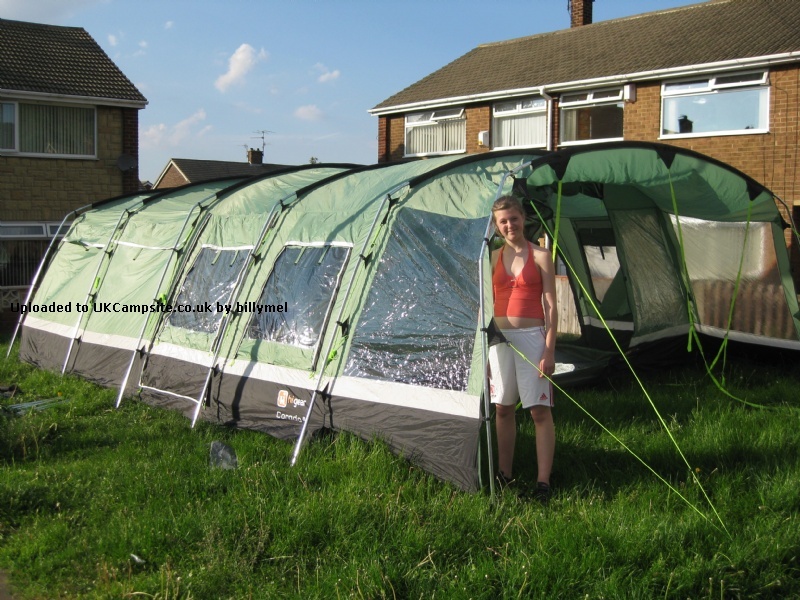 We wanted something that would last so our girls can grow up & not out grow the tent. 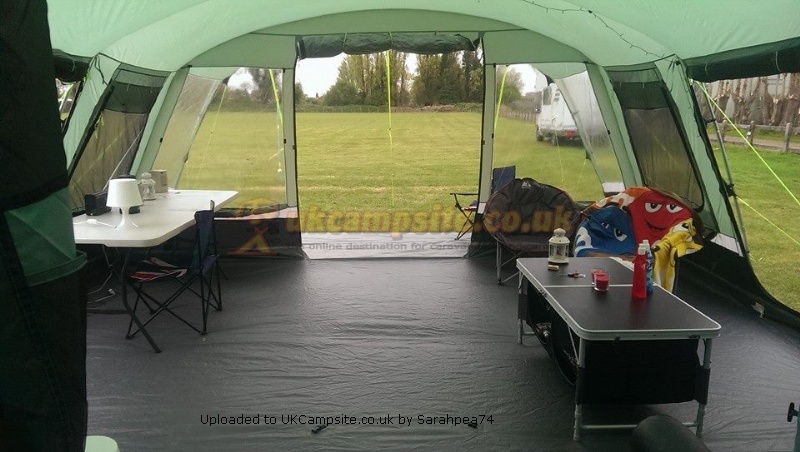 Somewhere big enough so if the weather is poor we can eat at a table & space to move in the tent. Also if friends/family want to tag along they can. 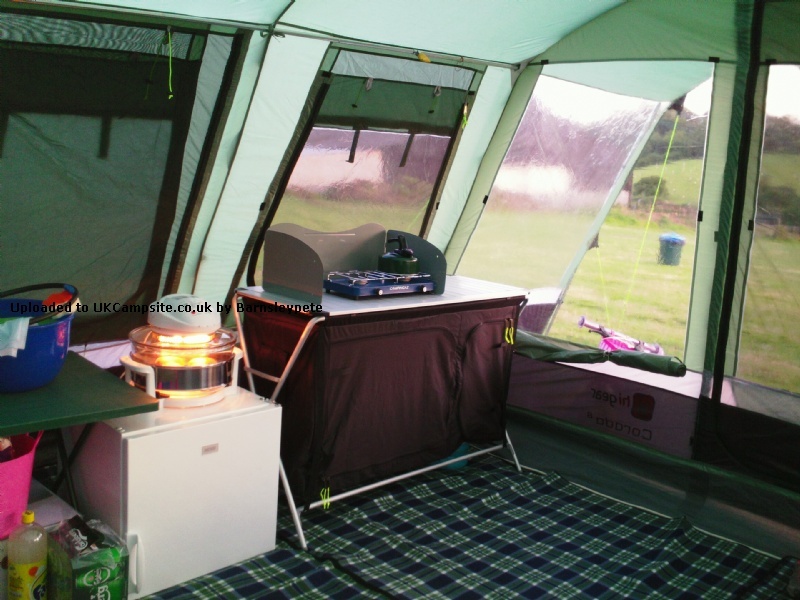 We have just used it for the first time on a cliff top in Yorkshire. The first night we had gales & on the third night we had some heavy rain. 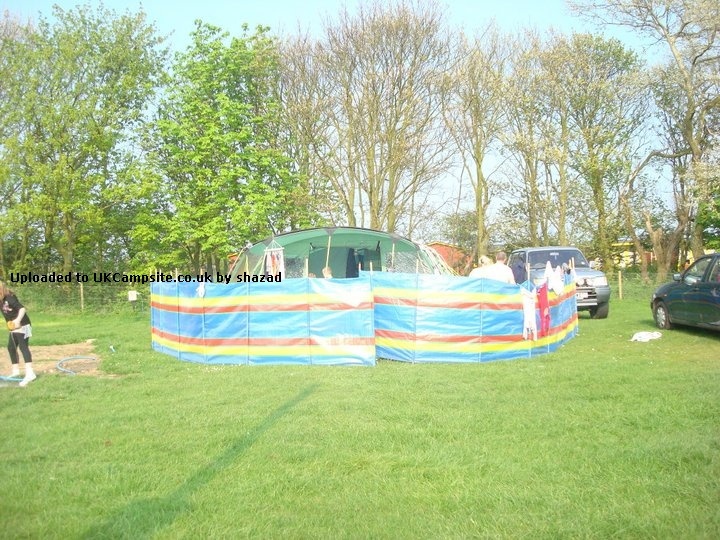 The tent withstood it all. We are very happy with our purchase but we are having problems with the front door. 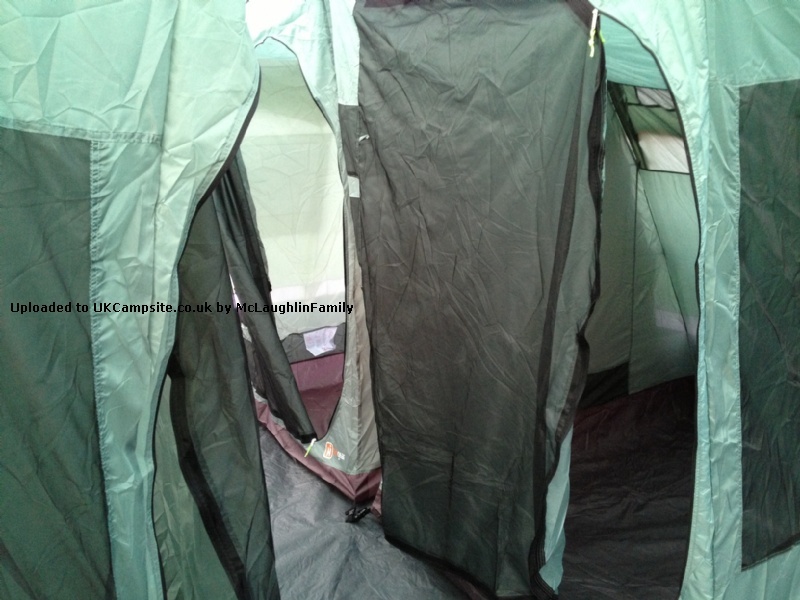 Zips are extremely tight & a bit dicky but this was picked up when we researched the tent. It is easy to put up/ dismantle even with & 3 & 20 month old. 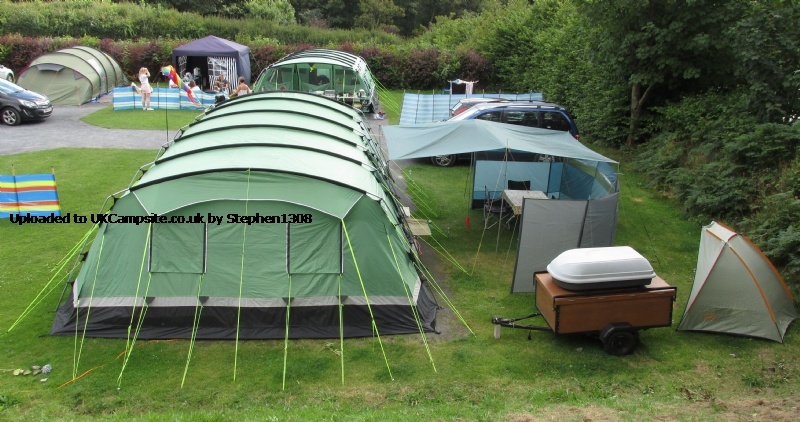 I am now addicted to camping again & looking forward to our second trip in a couple of weeks. 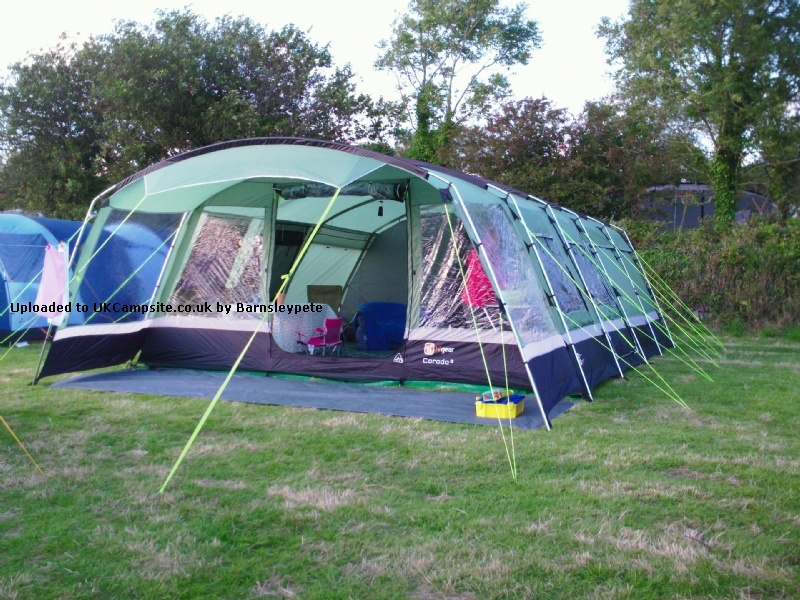 ABSOLUTELY ADORE THIS TENT! 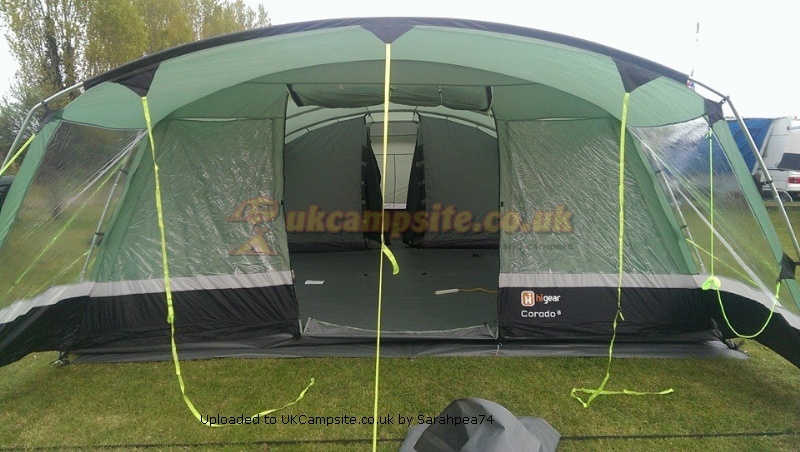 We first saw this on site a couple of years back and were impressed with the size and quality of it. 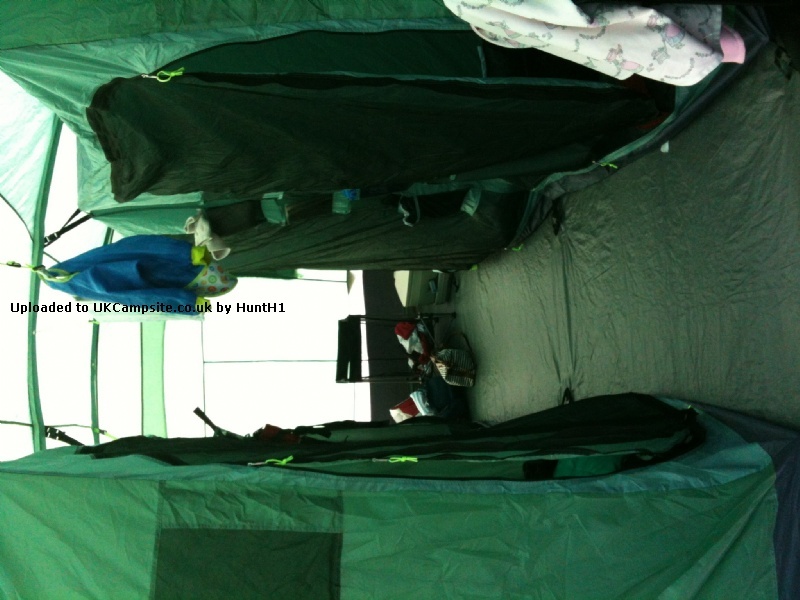 Being a scout leader and have stayed in MANY tents, some of them not so good, so the quality was obviously important to us. We were lucky enough to pick ours up on eBay on a really good deal. It had not been used and most of it was still in its original wrapping. 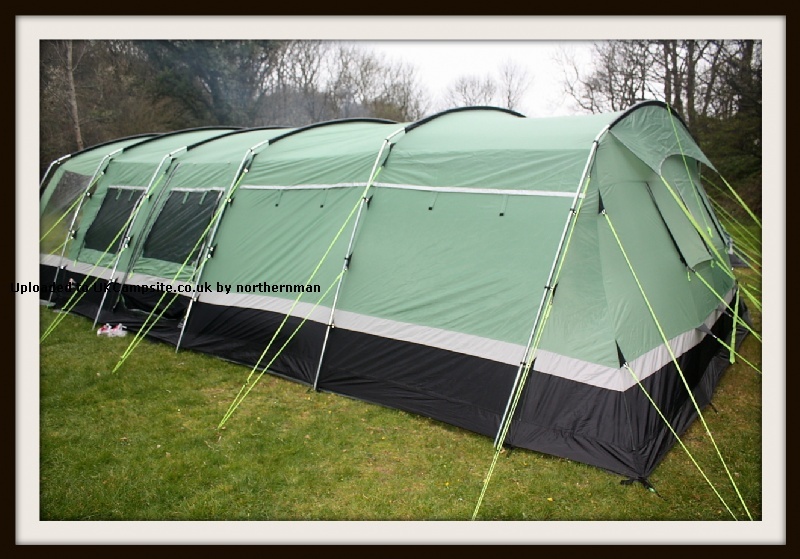 The whole process of erecting the tent is not too bad, yes it is a job for 2 people, however once you get the knack of it's straightforward. 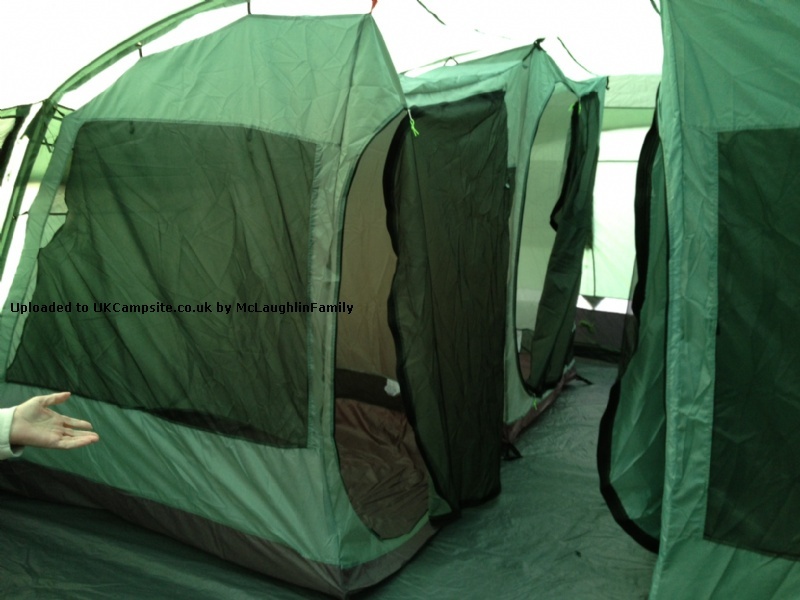 As others have mentioned there is quite a bit of tent envy when on site, and you do get a few visitors who want to have a nose round. This is great as it starts conversations. 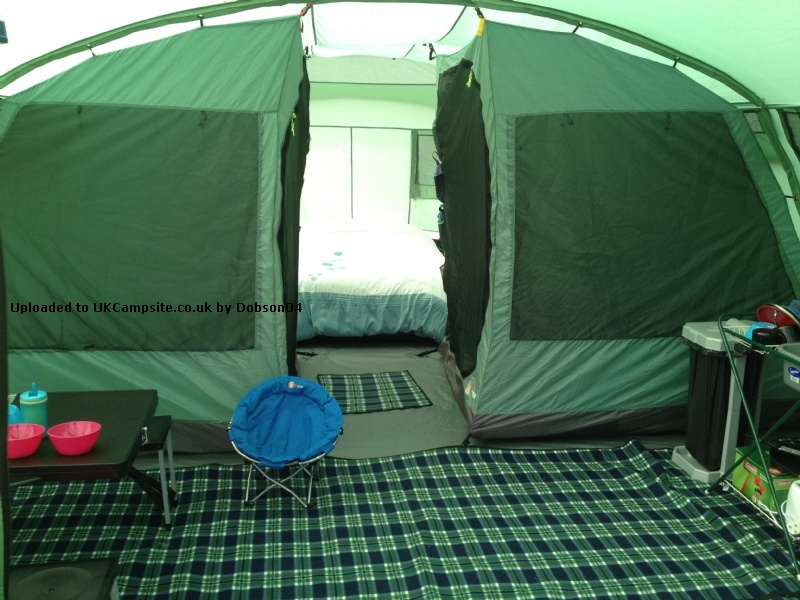 We have had 10 sleep in this comfortably and still has plenty of space to move around in the good old English weather. 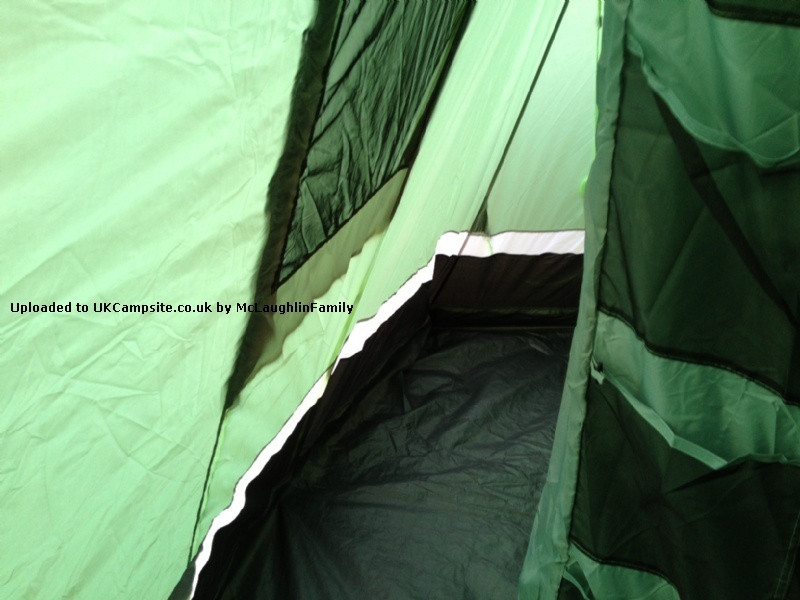 It has even been used as a dining tent on a really cold and wet Scout camp. IF you can pick one of these up from anywhere it is well worth the spend. Oh my god it is huge. 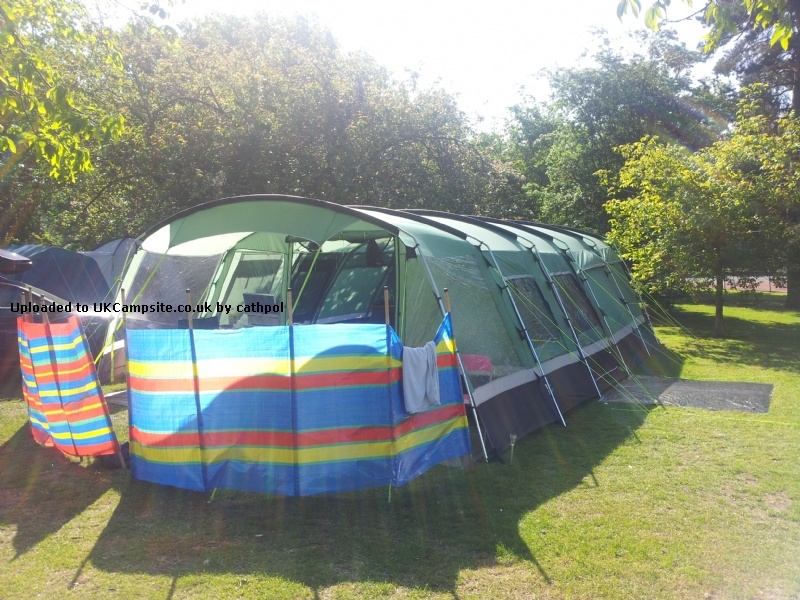 When booking pitches make sure that it will fit as we stayed at Ladram Bay and they tucked us in a corner where we had to tie off to railway sleepers and nearby trees. As already mentioned there are loads of vents to open to allow a good airflow and having three doors access is good as well. 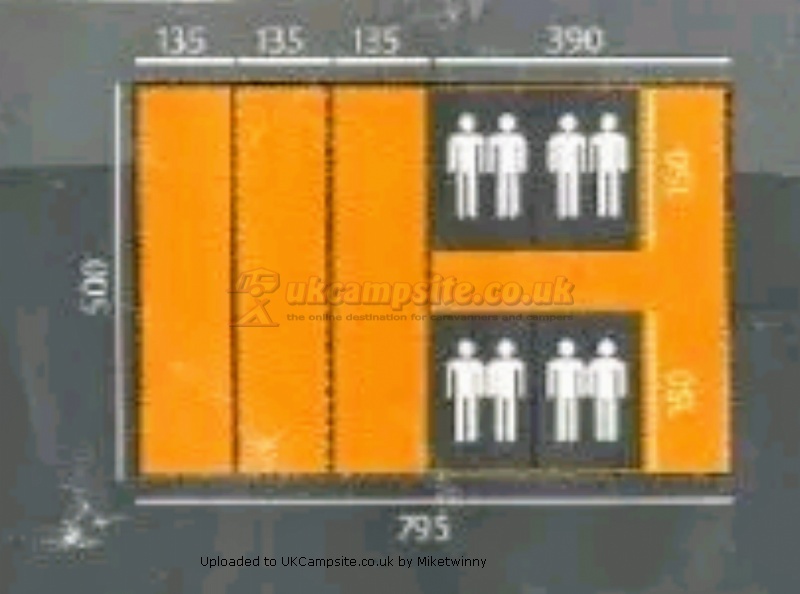 I am over 6 foot and the internal height allows you to walk around without having to stoop. 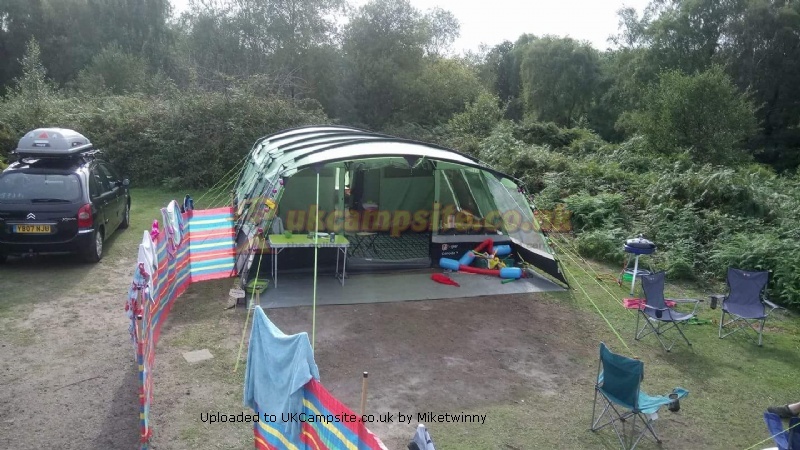 The bedrooms are ok but a little small in themselves as we only put up the front 2 for the kids and left the whole of the back area for our large Coleman queen double bed as it would not fit in the bedroom. 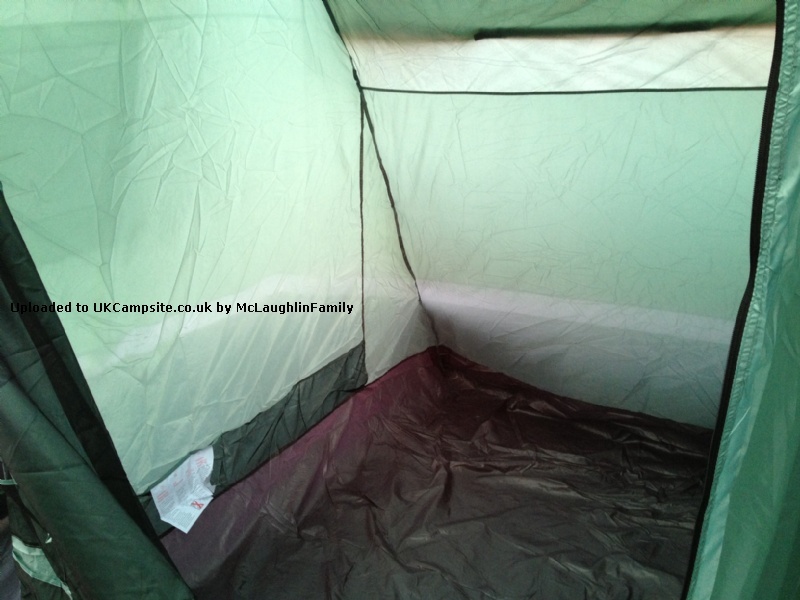 If you do use all four rooms then there is still a handy storage area right at the back of the tent for any empty boxes or bags. 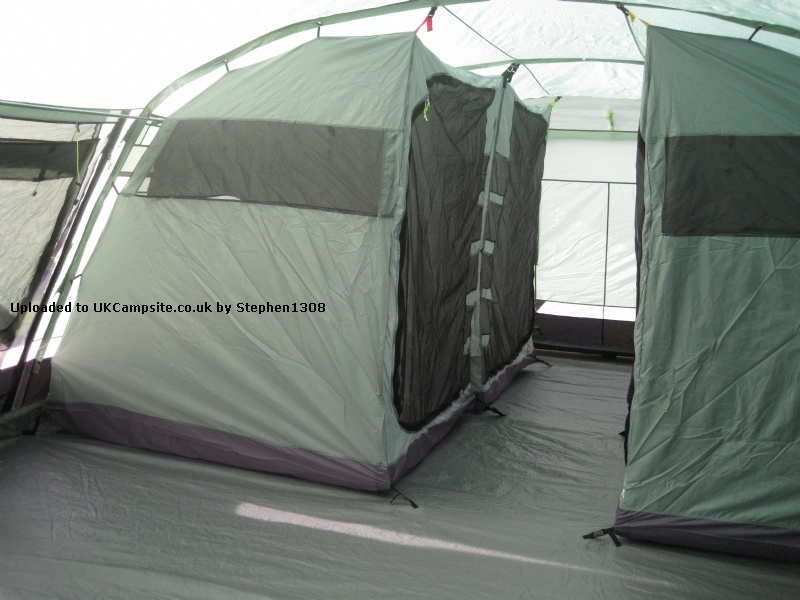 The lighter colour of the tent means that it stays a little cooler in the sun than the darker tents which is a bit of a plus. 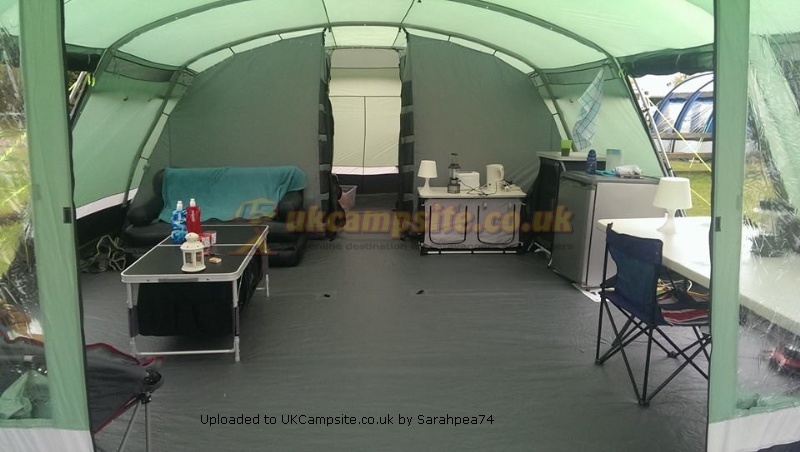 The living space at the front of the tent is large enough for an inflatable sofa 2 tables and a cupboard without being too pushed for space. 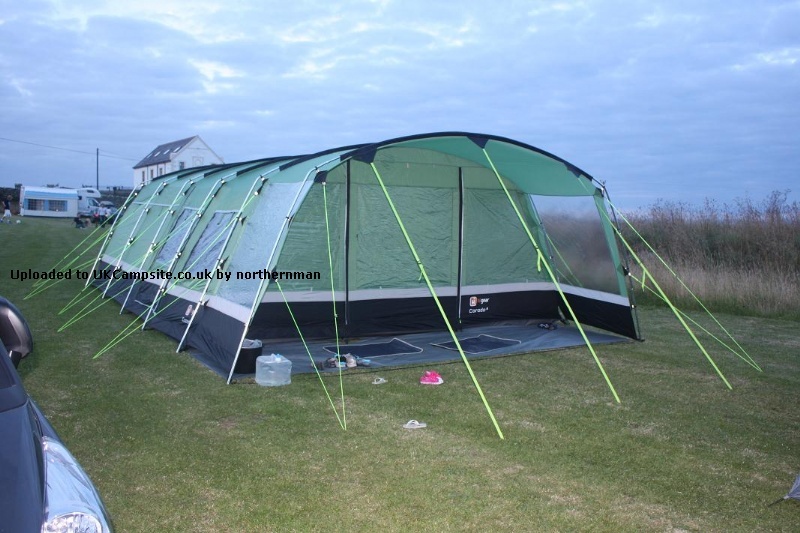 The main downside of this tent is the size and weight when packed I think it tips the scales at about 70kgs packed into 3 bags (1 tent and 2 poles). 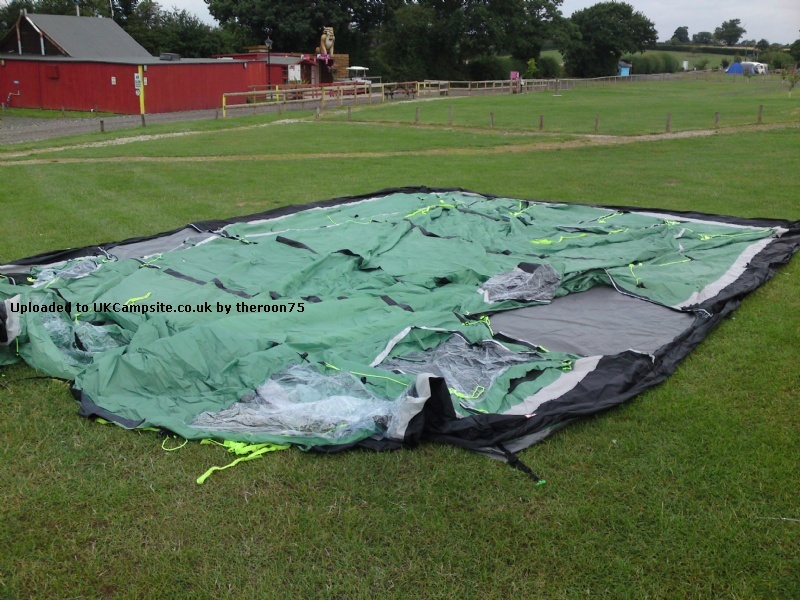 We never had any stability problems in high winds but did find you got a little bit of pooling on the roof if no wind to blow water off in heavier rain. This is only because of the vast roof area and maybe if we had been able to pitch properly we might have got the roof a lot tighter and this may not have happened. 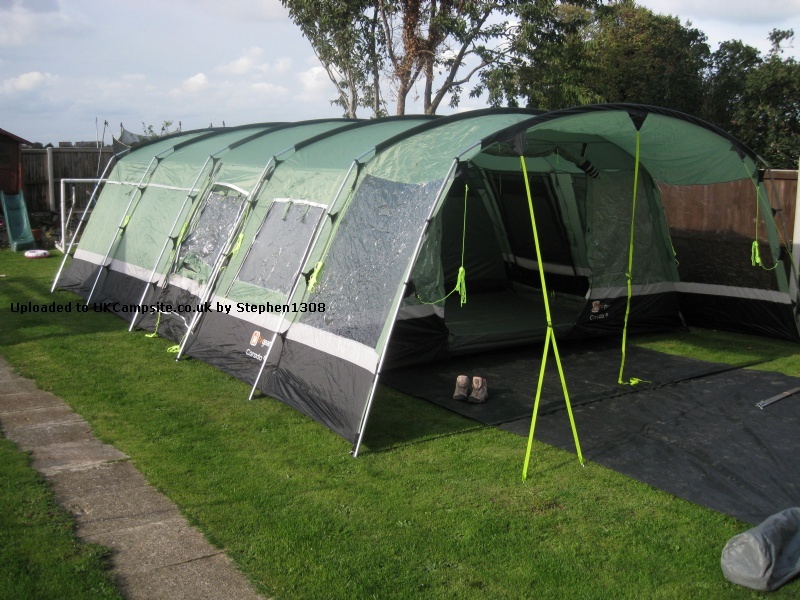 Ours is the later version with the fully zipped door and one piece construction. 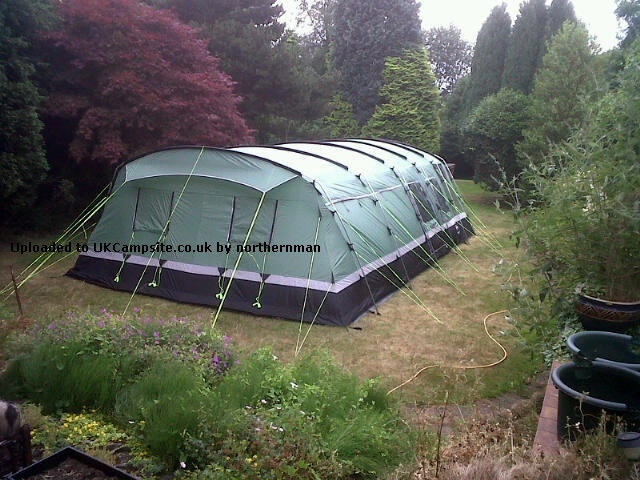 It takes under an hour to pitch and is fairly easy to do although the steel poles are a little heavy. 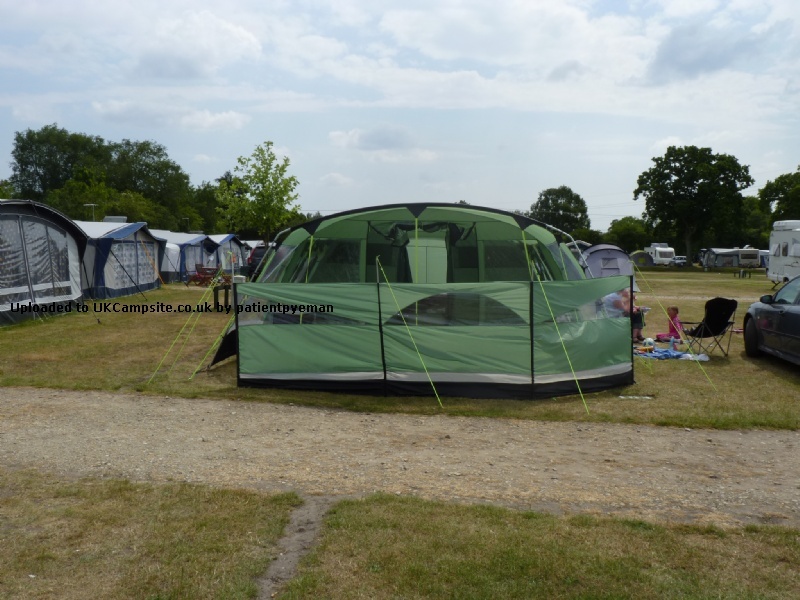 To sum it up if you want a large family tent then look out for one of these. 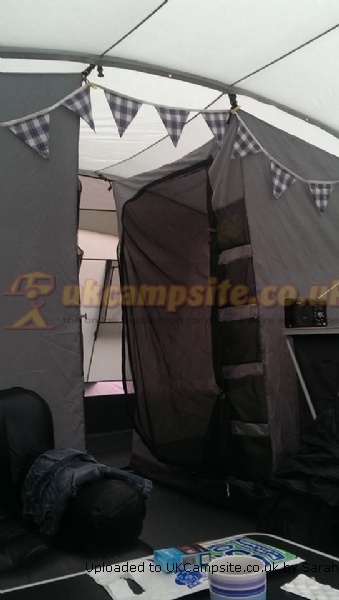 Why they have stopped making this tent or one with a similar layout I don't know. 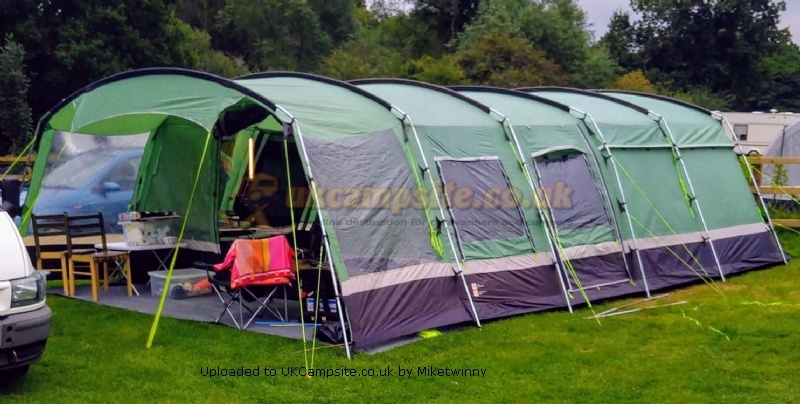 When we purchased our Corado8 we were new to camping and wanted a large tent (there are six of us) without spending a small fortune, just in case camping was not for us. 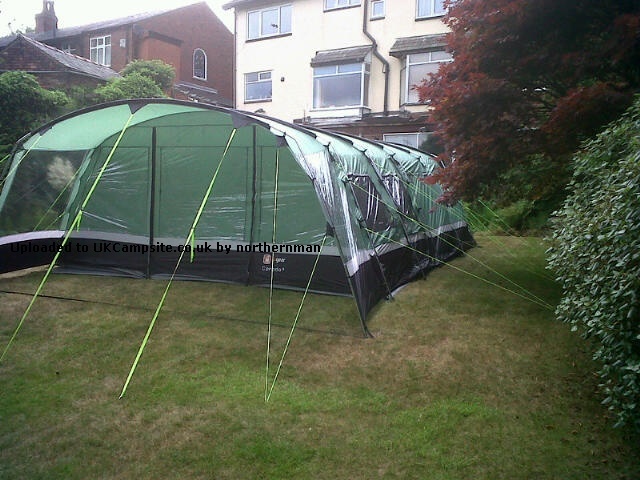 I have to say that you will struggle to find a better tent for the money! There are always deals available so it will not cost anywhere near the list price, we got ours using a discount card and in a sale, so we did get a good deal. The layout is fantastic, having the bedrooms at the rear with the corridor in between works well and allows for lots of hidden storage space. 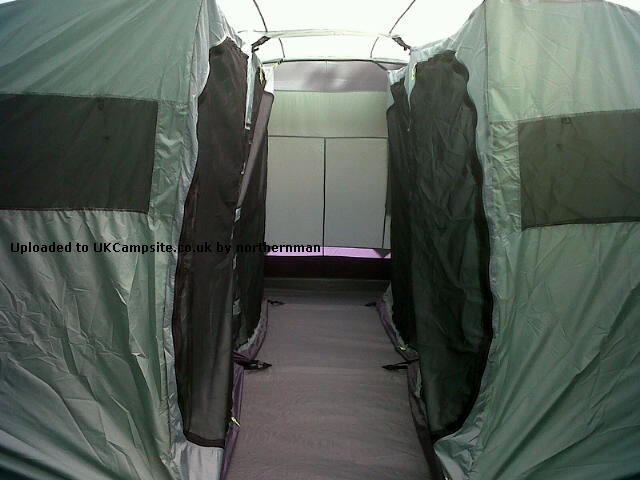 The canopy or porch at the front stops most foul weather providing some cover for shoes etc. 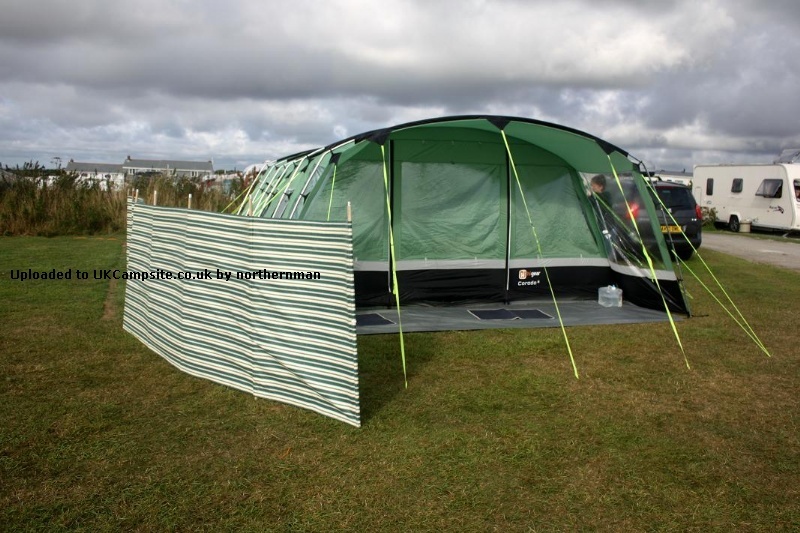 We have used our tent for the past four years in some horrible weather and it has stood up when others around us have suffered, not at any time leaking or causing any concern when at times facing storms coming from the sea. 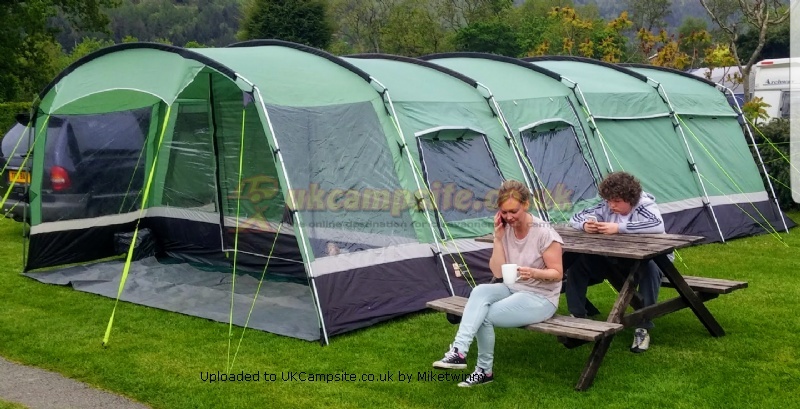 I have to admit that I have only one small criticism of this tent which can be aimed at almost any polyester tent in that when the sun comes out it warms up! 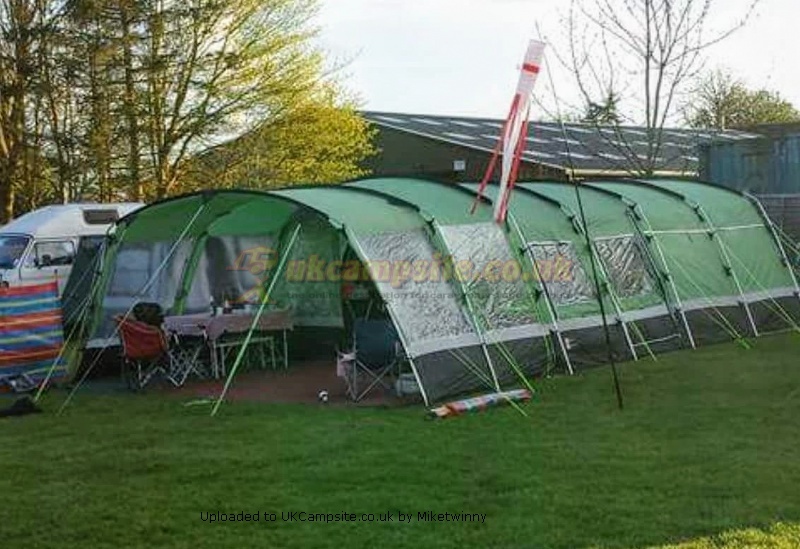 I hope that if you are reading this looking for a very large family tent for your introduction to camping, that will have people looking on in awe at it's size, then I have given you the confidence to buy a Corado8. 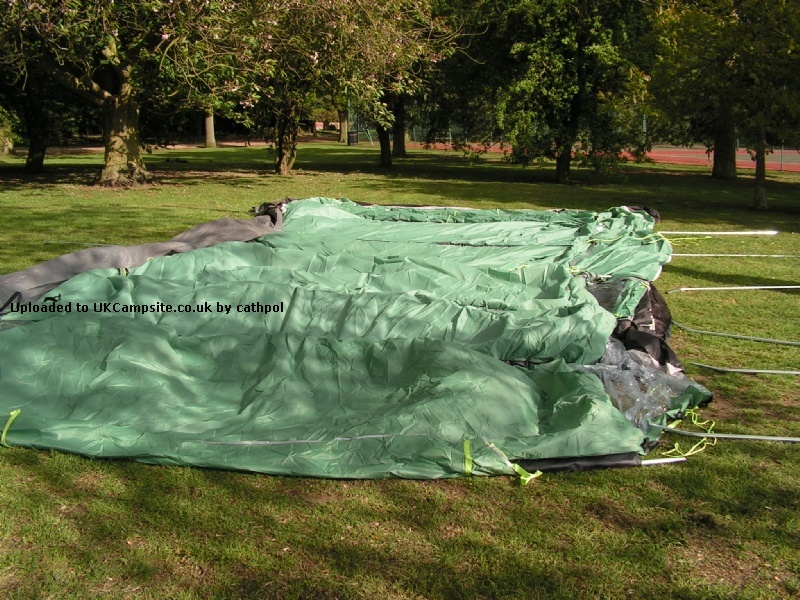 I am glad that we used this unit for our intro to camping and if they made the same tent in polycotton I would buy one immediately. 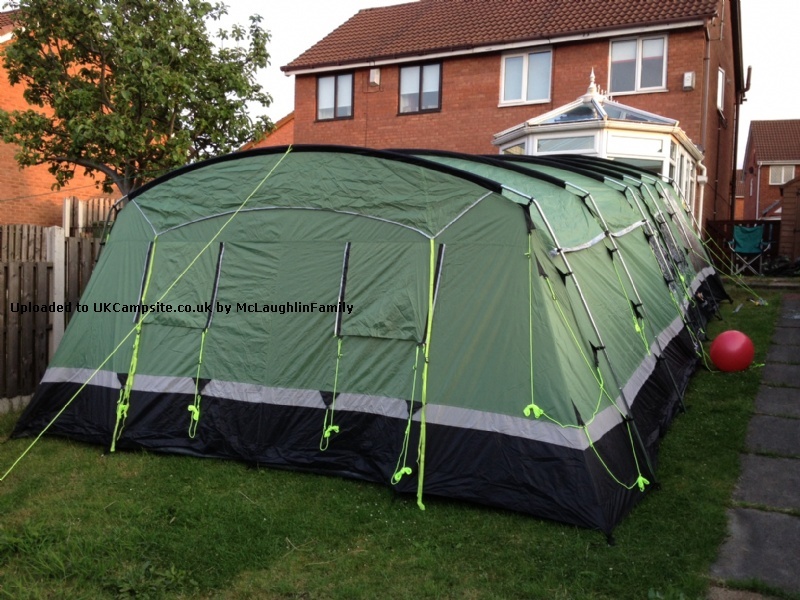 Having now owned four large tents since 2000 we have (fingers crossed) high hopes for this tent. 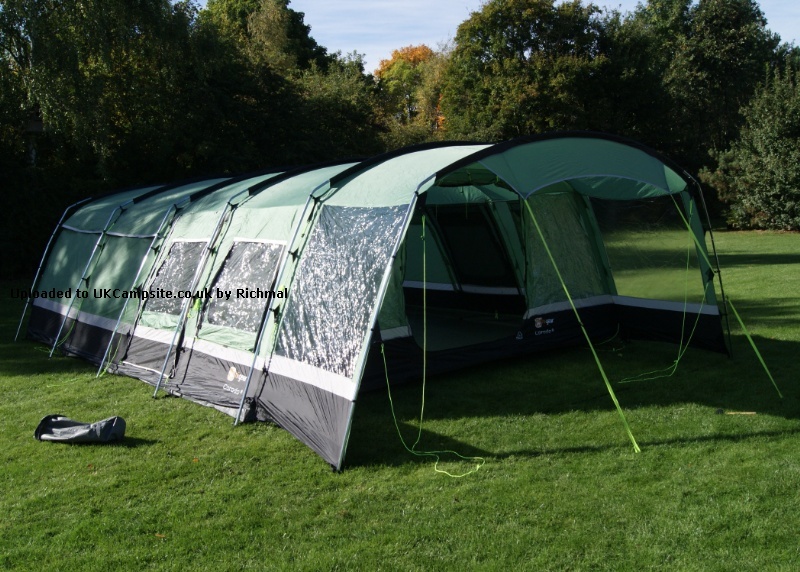 Our first family tent was a Relum Khios XL which served us exceptionally well with our young daughter for a number of years all over Europe and in all conditions! 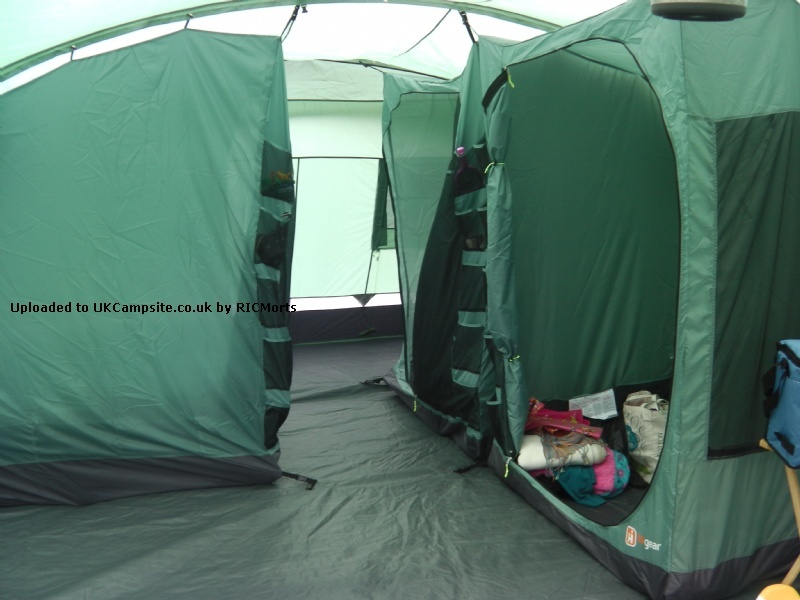 Following this our twins arrived and we didn't camp for a few years but then purchased a Vango Tigris 800 with extension canopy and took this to France in 2010 and again had a fantastic time and experienced some turbulent weather. 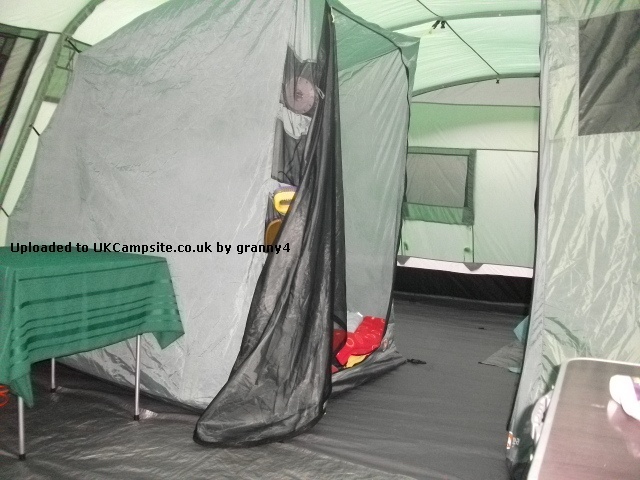 The tent stood up well to the conditions. 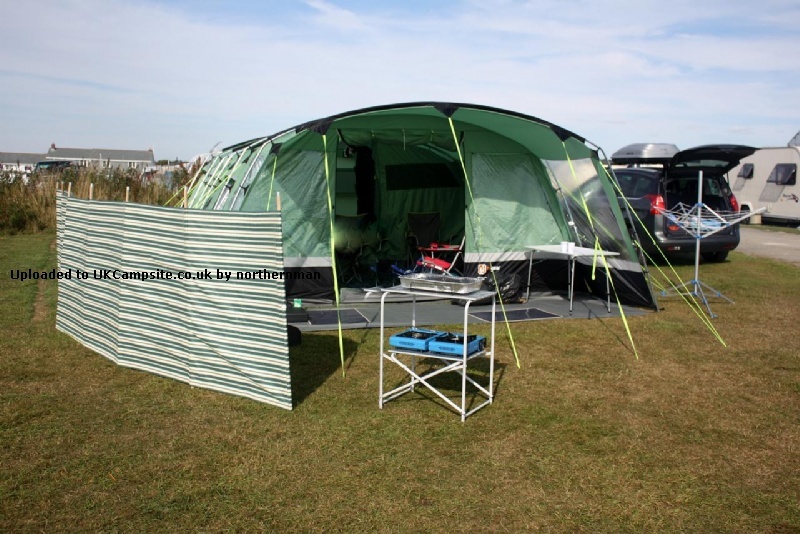 The Vango was packed away dry and stored in our garage until this summer when we took it to Devon. 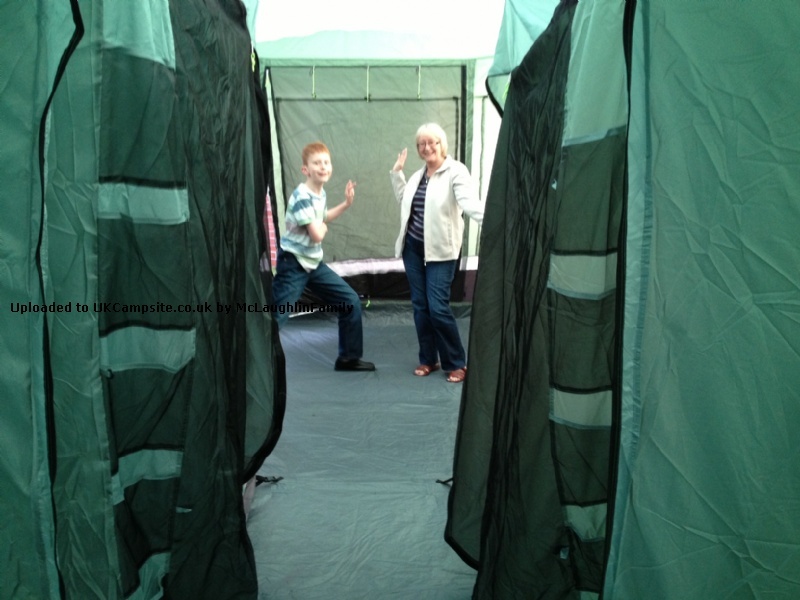 Mid stay the heavens opened and the tent leaked like a sieve all over - we believed our only option was to pack up and go home or purchase a new tent. 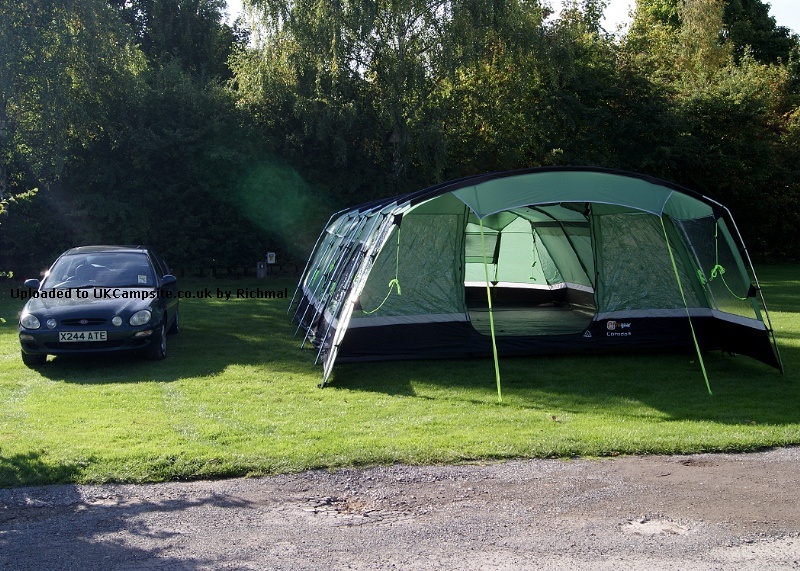 We opted for the latter and bought a Kampa Watergate 8. 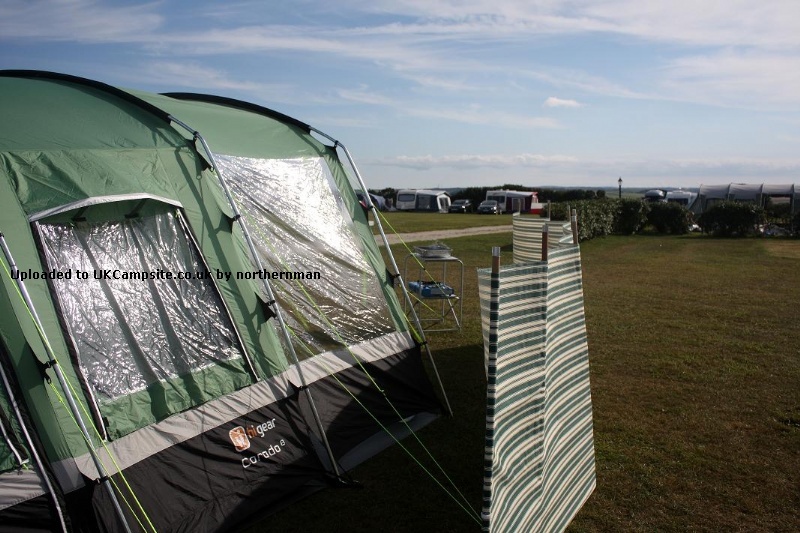 When erecting the Kampa we thought the tension on the poles was excessive, however the tent went up and we concluded the holiday. 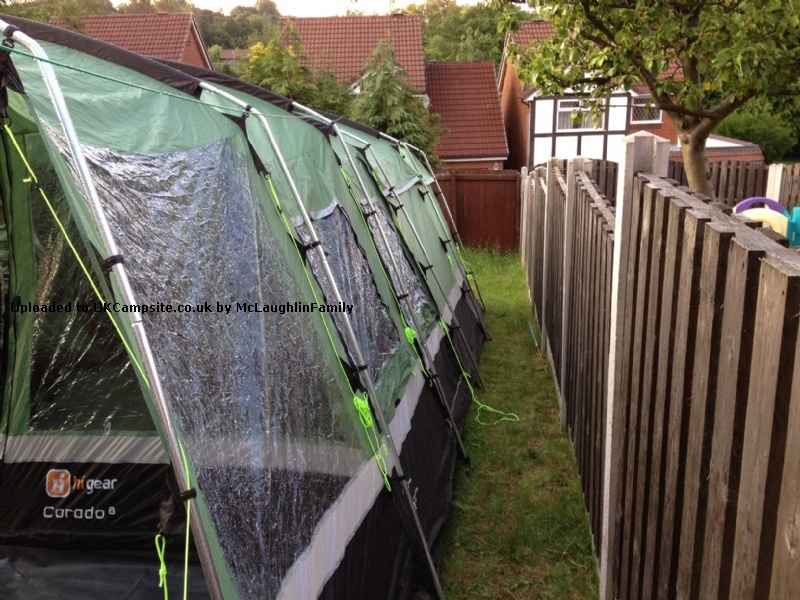 When we got back home we decided to put the tent back up in our back garden and give it a full check over. 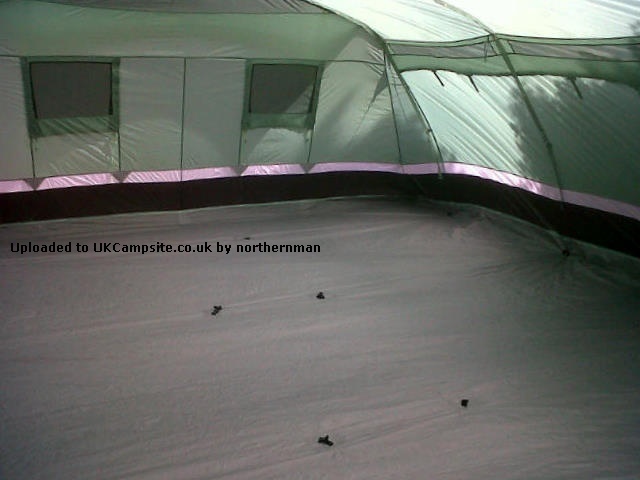 This resulted in two of the fibre glass poles fracturing and the discovery of a manufacturing fault with the tent. After a bit of a struggle we received a full refund. 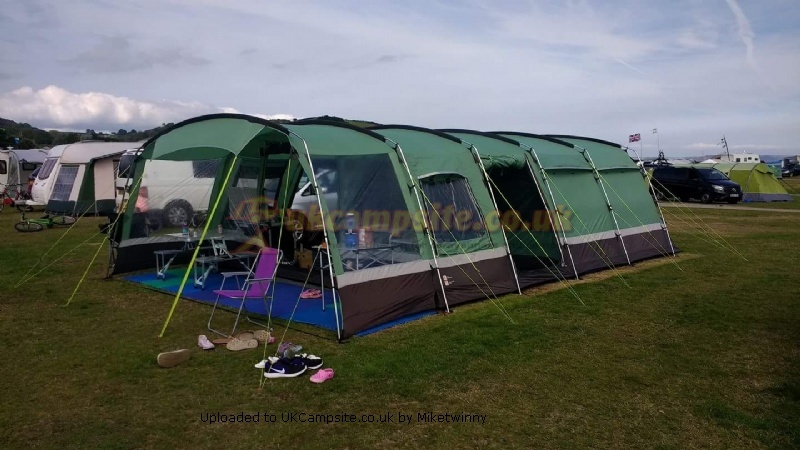 As you can imagine, by this time we are a little disheartened, not with camping, but the quality of tents on offer (excluding the Relum which was faultless). 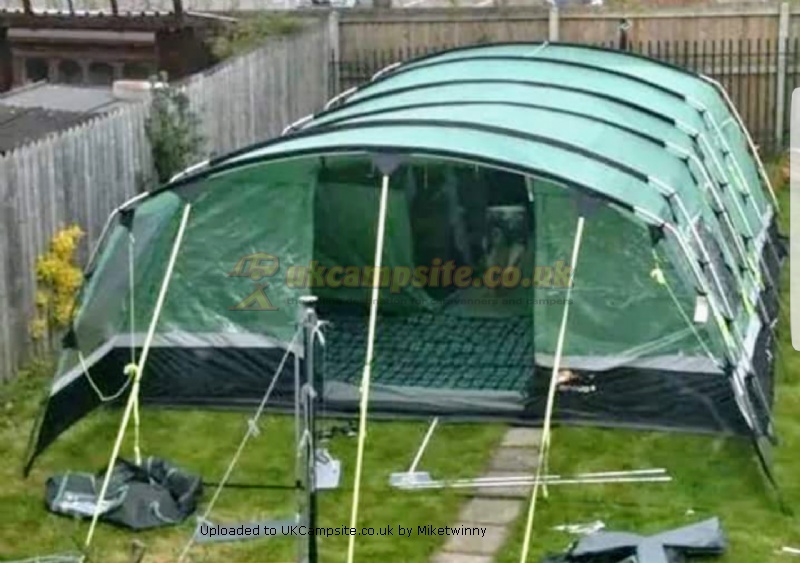 We saw the Corado at our last site and have read the reviews and purchased a Corado - we have erected it in the garden and all appears to be good so far. It is the model where the front door doesn't zip all the way round (it was a customer return at a greatly reduced price) but we don't have any concerns in particular and hope that this will restore out confidence. 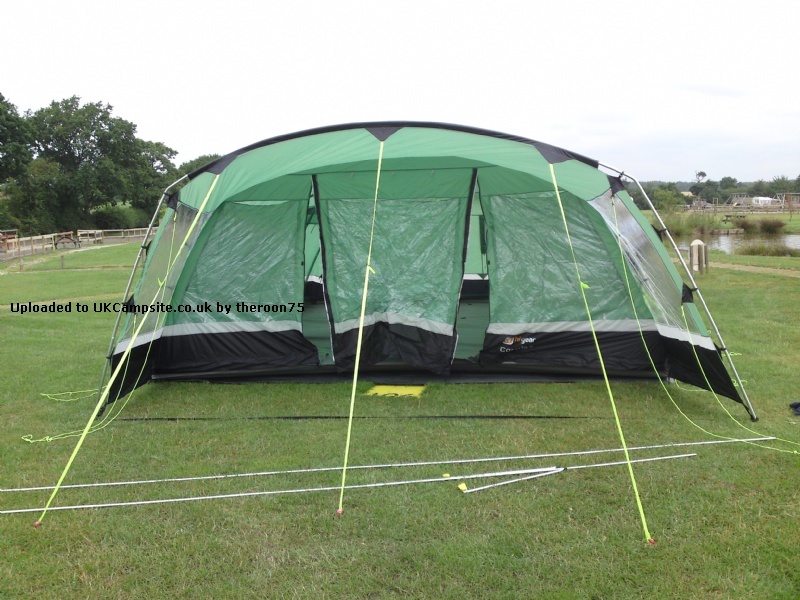 The tent has some great features and flexibility - if anyone has any tips to ensure we are not let down again, these would be greatly welcomed! 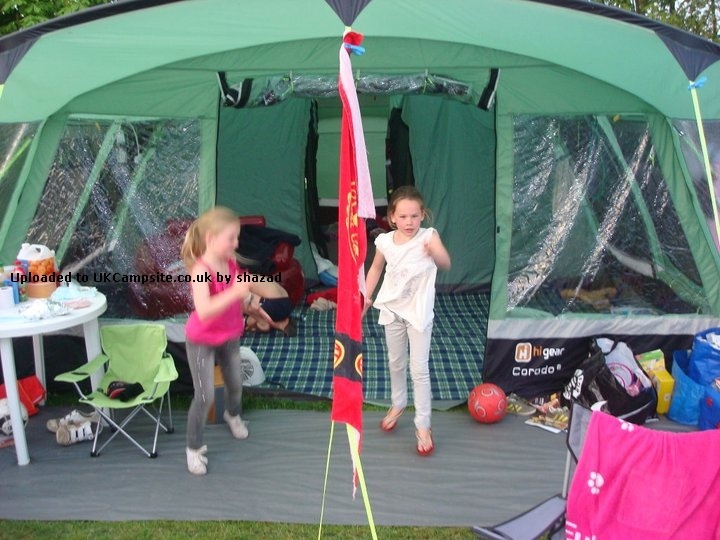 We have three children who love camping and we want to ensure that they have many more great experiences. Bought our corado off ebay and have to say I am thrilled to bits with it. 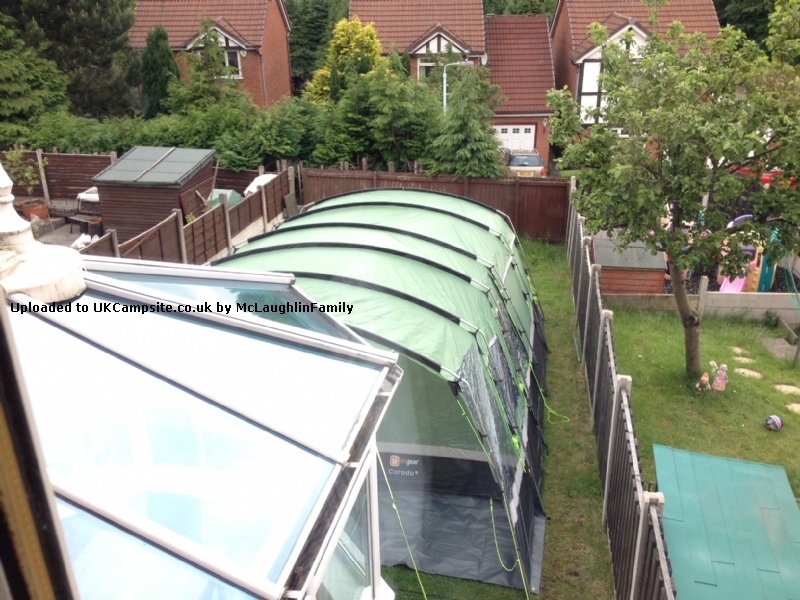 It huge and has plenty of living space when the pods are put up. 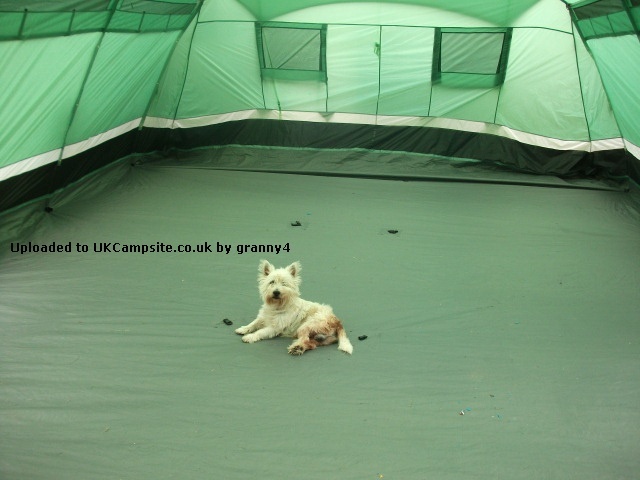 We have been camping in it in heavy rain and wind and it withstood it no problem. 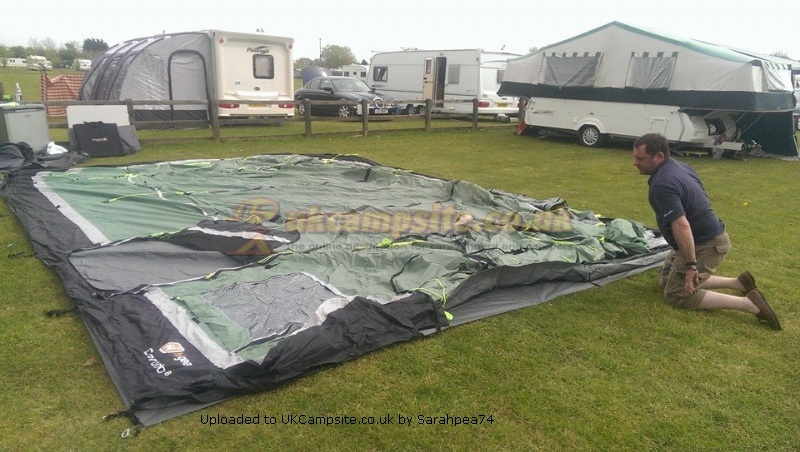 It gets lots of attention of the campsites because of its sheer size and we had quite a few visitors for a look around inside and there was a lot of tent envy going on . Cant wait to get out and pitch it again. 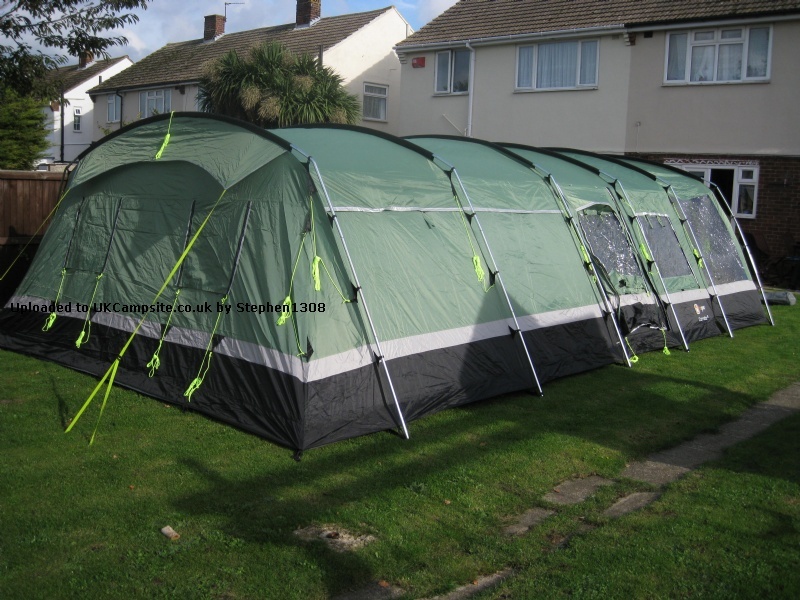 We are a family of 5 (kids 6,8,10) and have had this tent for a year. We have used it 4 times and love it! 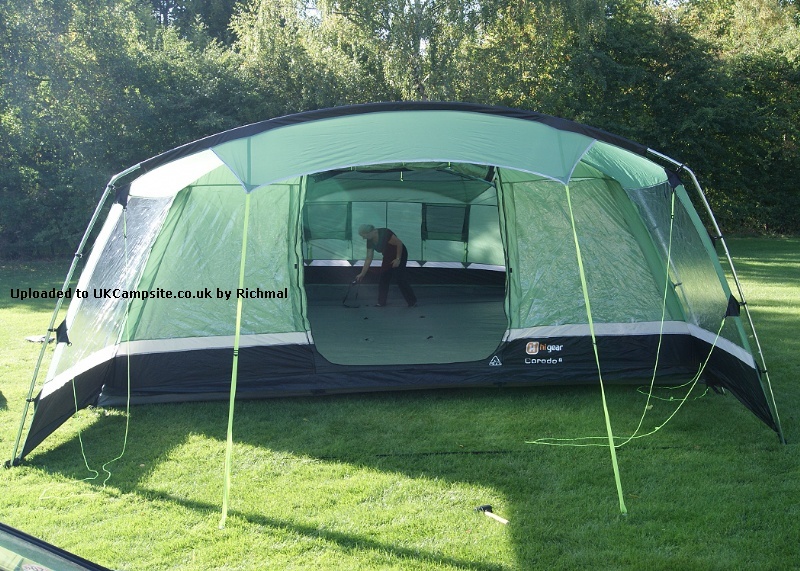 It is massive - to put into perspective the 8m x 5m you could park two cars in it if the front door was wide enough. We only have boot space in the car and it is big in the bag. 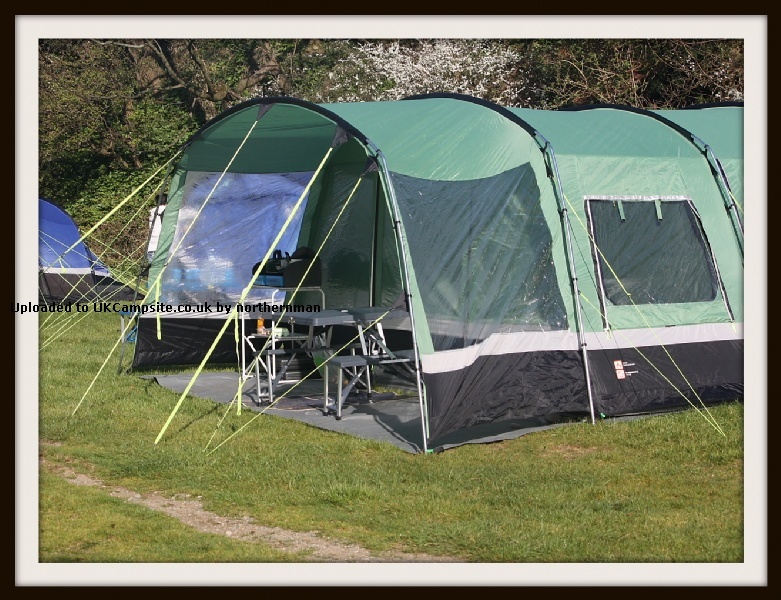 The canvas can be rolled really tight and secured with bungees rather than let it expand with air once in the tent bag and the poles weigh quite a bit too, but that's why we love it- it is solid once up and the envy of any camp site. 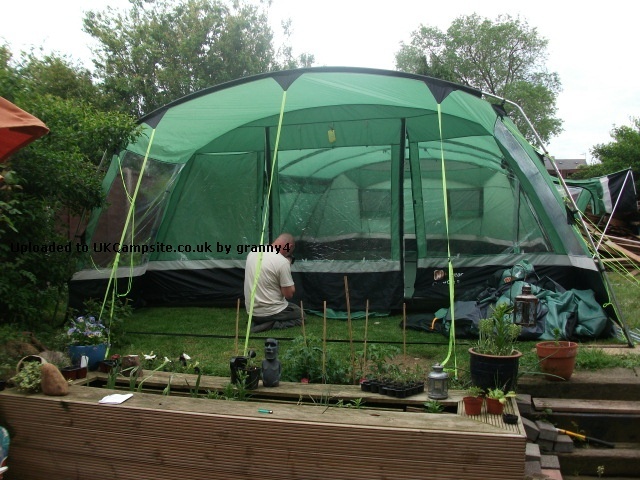 There is no doubt you need two people to put the tent up. 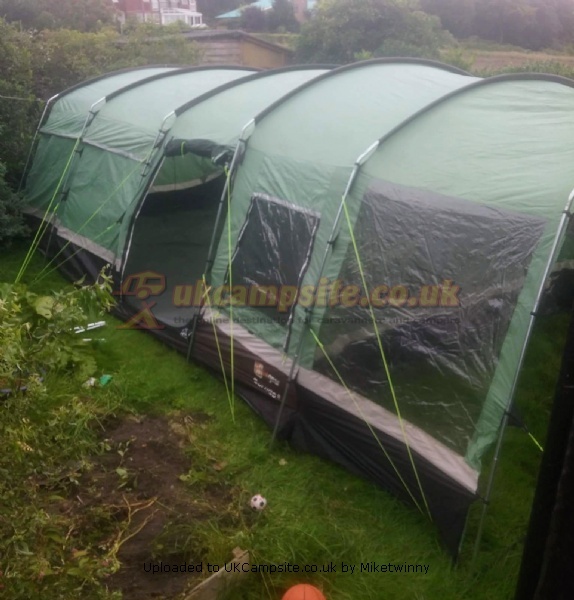 It has been used in wet weather and did not leak, reading the reviews there seem to be loads of poor quality tents out there but we are really satisfied. 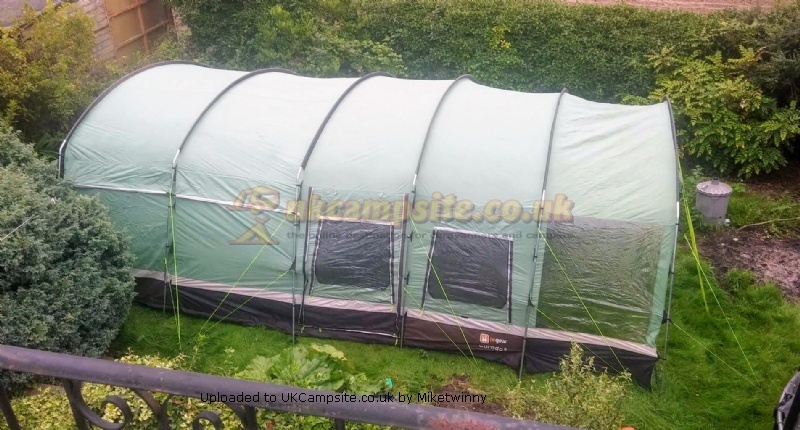 Due to the size of the tent ensure that when booking a site you let the owner know its dimensions - because it might be too big for their pitches (I did not consider this prior to buying!) or they may want to try and charge you more once they see the beast up! 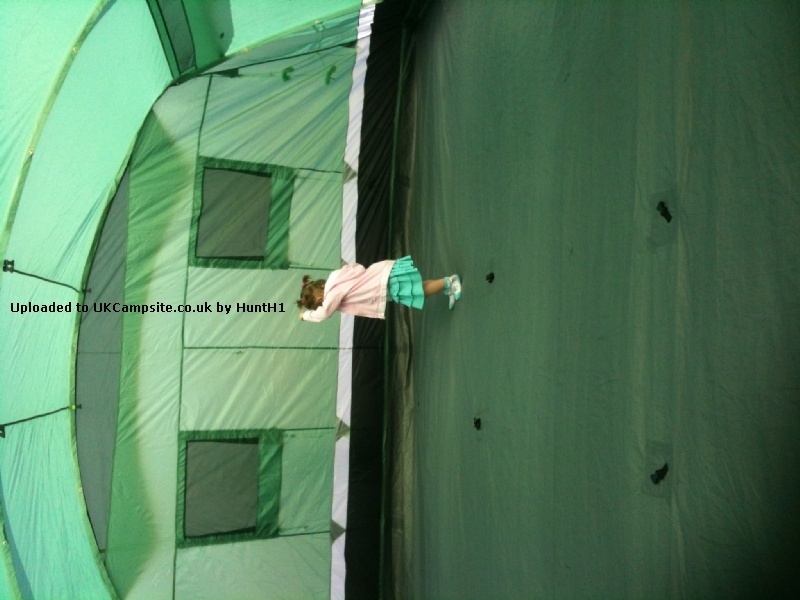 The most important thing is that our kids love it and want to go camping all the time! 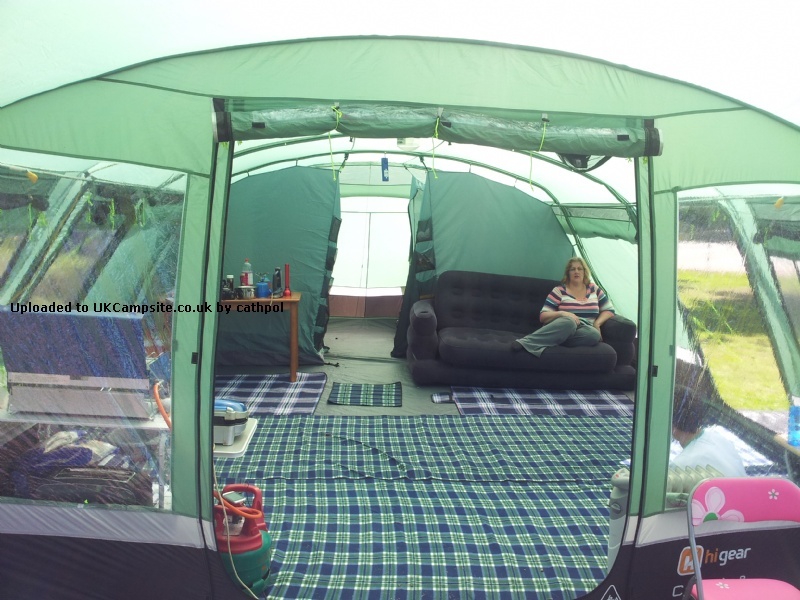 and even when its wet the living space affords the whole family to sit down in chairs and play games or chill out rather than being on top of each other on sleeping bags. 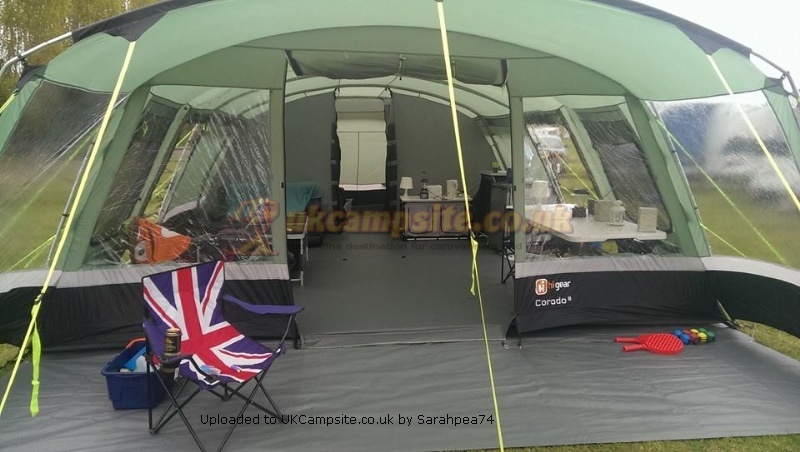 The bedrooms are a great size, the storage at the back is really useful and the canopy at the front deceptively big for those less than great days when you want to be out, but still want to be out of the rain. It's a crying shame I had to get this second hand as GO don't do this anymore, but although it said second hand (used/ex store/needs reproofing) we were lucky enough to realise it's brand new and no faults so we got a bargain as well! 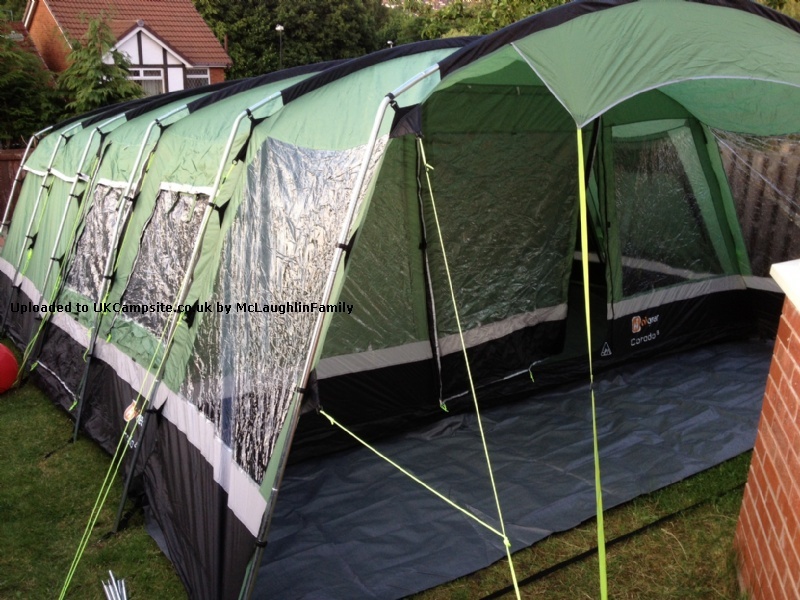 Add your review of the Corado 8! 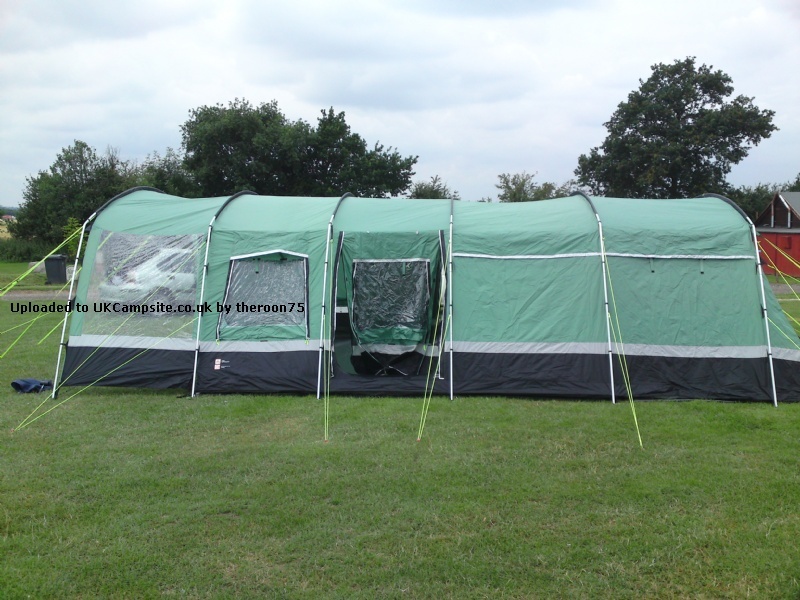 The Hi Gear Corado 8 is a large 8 person family tent that offers a great combination of space and practicality. 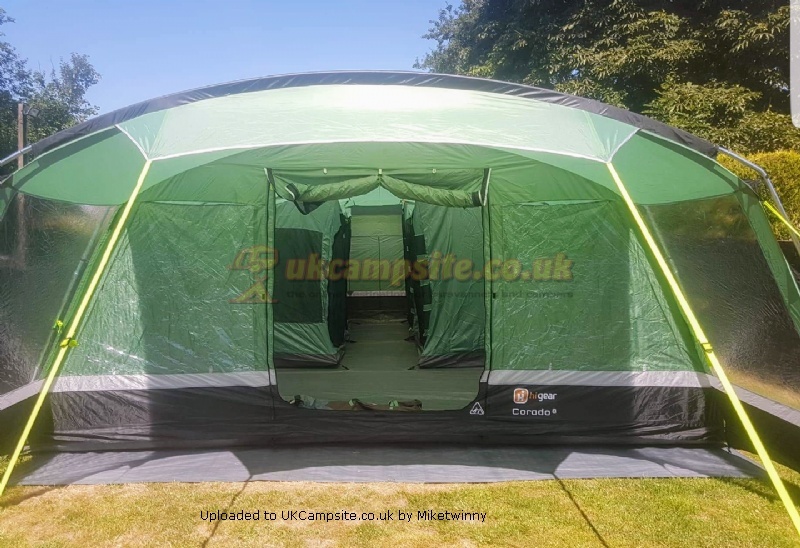 The door canopy offers the facility to cook inside or out without damaging the groundsheet, and the choice of entrances allows you to choose your layout of tent furniture to suit your camp, and to ventilate the tent fully if it overheats or fills with barbecue smoke. 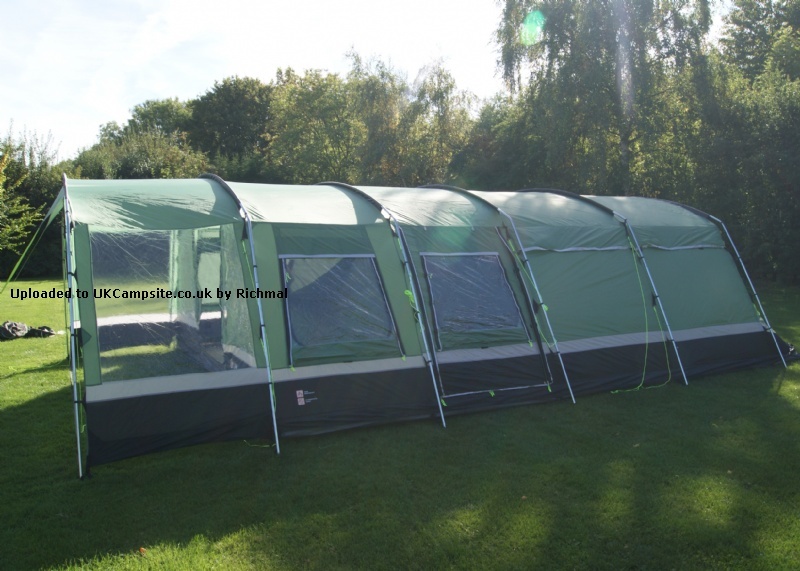 To give you and your fellow campers even more space and luxury, it's possible to extend the tent using the Hi Gear Corado 8 canopy.